Warm oil in an 8-inch skillet over medium heat. Add shallot and cook for about 2 minutes, until softened. Add garlic and continue cooking for 30 seconds. Add ground chicken, salt, oregano, and red pepper flakes and cooking, stirring frequently and using a spatula to break up the meat, until chicken is cooked through and any liquid has evaporated. Stir in the tomatoes, gnocchi, and tomato paste and raise heat to medium-high. Cook until meat sauce is thickened and no longer watery, 4 to 5 minutes. Stir in parmesan. Smooth out the gnocchi and meat sauce. 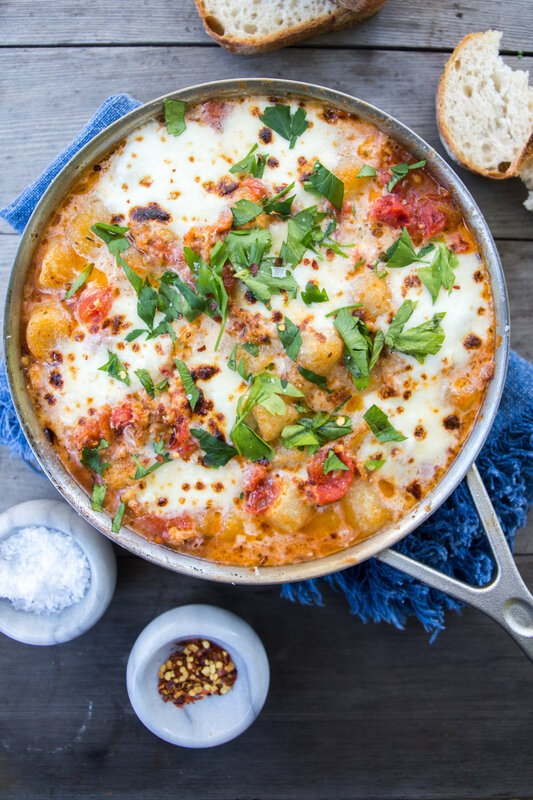 Tear up the mozzarella with your hands and place it on top of the gnocchi and meat sauce. Broil for 3 to 5 minutes, until mozzarella is melted and beginning to brown. Garnish with parmesan and parsley and enjoy! For the mozzarella, you can use the hard kind, but what I want you to use is a fresh ball of mozzarella, the kind that often comes packed in water. You could also use burrata if you’re feelin’ fancy. Wanna make this even easier? Cook the chicken, stir in 1/2 of a 24-ounce jar of your favorite pasta sauce, the gnocchi, and the parmesan, add mozzarella on top, and broil. 4 ingredients! Don’t have a Trader Joe’s? Regular dried gnocchi work here too, just make sure they’re completely tender before transferring the skillet to the oven.